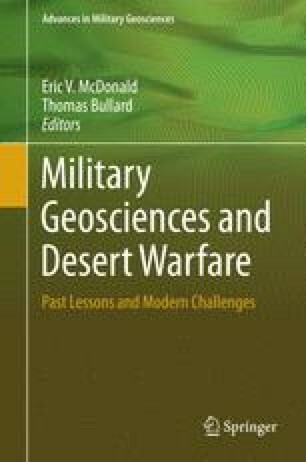 The history of the US Army Yuma Proving Ground (YPG) as the location for the scientific investigation of the natural environmental effects of desert climactic conditions on men and material of the United States Armed Forces, begins with the national response to our entry into World War II. As the Nation awoke to the terrible news of the Japanese attack on Pearl Harbor, we also awoke to the fact that as a Nation we were totally unprepared for war. The Desert southwest of North America was seen as an ideal location to take care of many of these issues of military preparedness that now faced the Nation. General Patton’s Desert Training Center (DTC) was established to quickly get our forces ready for War in North Africa. The DTC would evolve to become so much more. War-time requirements undertaken in the Desert Southwest came with an extreme sense of urgency. In an effort to compress development time for the new and improved materials of war, Research, Development, Test & Evaluation (R, D,T&E) was conducted in the natural environment in order to more quickly derive results. The U.S. Army Quartermaster Corps, along with the Ordnance Corps would see the harsh environment and topography of Camp Seeley CA as offering ideal environmental conditions in which to test Army vehicles and their sub-systems. The U.S. Army Corps of Engineers would establish the Yuma Test Branch at the Imperial Dam, the ideal location to test tactical bridging equipment. In many cases, the Yuma Proving Ground occupies the same geography as these precursor facilities. In other cases it is the mission and heritage of those war-time entities that have continued to evolve at the Proving Ground. This paper covers this initial historic period, a period that covers from 1942 until 1950.